Home / The Archives / Take a Survey and Win! We’re running a little survey here on Commute by Bike and giving you a chance to win some cool gear. 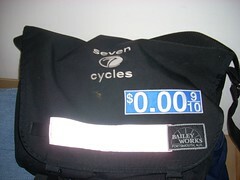 One lucky person will walk away with a shirt (in your size) and sticker from www.RideYourBicycle.com. I nabbed mine a couple months ago and love it. It’s started up a bunch of conversations with random people about riding a bike. Five lucky people will win a sticker set from www.ZeroPerGallon.com. If you have something patch worthy, you should head over and buy a patch off them. I’ve got one on my messenger pack. Now click the button and take the survey! Here is what my survey page looks like. Ok, I gave you your marketing data, now send me a prize.